Foresters Financial is very pleased to announce the appointment of Mr Craig Bell as our new Chief Executive Officer. Craig is a Fellow of CPA Australia (FCPA) and a Member of the Australian Institute of Company Directors. 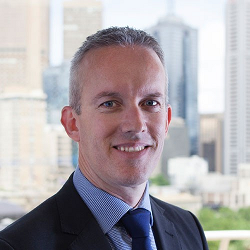 Prior to his role with Foresters Financial, Craig was the Chief Financial Officer at the Victorian Chamber of Commerce and Industry where he was responsible for Finance, IT, HR, Project Management, Investments and Governance. Craig is also a director of the Lord Mayor’s Charitable Foundation and Chair of the Audit & Risk Committee. Craig has over 25 years’ experience in Finance and ICT, having held senior positions across a number of sectors. This includes roles in top tier investment firms in London at Lloyds Bank TSB, Salomon Smith Barney and J.P. Morgan, and in Melbourne at ANZ, NAB and Chimaera Capital, along with various financial positions in the Victorian and South Australian State Governments. Bringing significant talent and experience to the Society, Craig is well placed to help Foresters continue to address the needs of our members and industry partners.